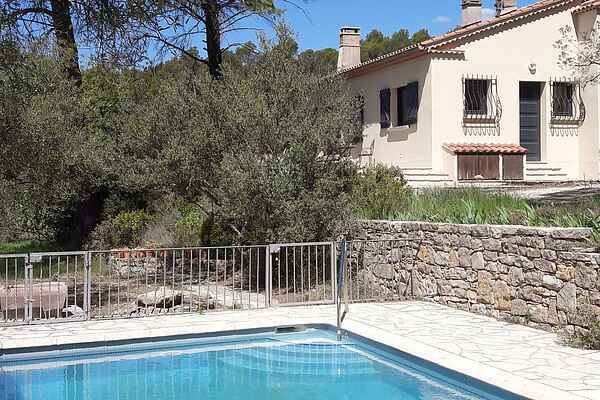 In the middle of the beautiful forest of Sant-Antonin-du-Var (3 km) near the village Lorgues (6 km) is where this beautiful vacation villa with private pool is located. By driving over the bumpy forest road, past the vine yards, you'll arrive at this idyllic spot in the forest and your holiday can begin. Compleet tranquillity and nature and more than enough comfort to enjoy yourself on your own domain of 3 hectare. You can of course hike on your own domain, however there's also enough to do in the surrounding areas. You shouldn't miss the tuesday market in Lorgues, the largest and cosiest market in the Provençal region. You can stock on lovely wines at Château de Berne (7 km) on route to Salernes (15 km) starting in Lorgues. For the large supermarkets and more stores you can go to the city Draguignan (20 km). For a day at the beach at the Mediterranean Sea, you can go to Fréjus (45 km) or the swimming lake \"Lac de Ste. Croix \"(38 km).